Why more men should do Yoga. 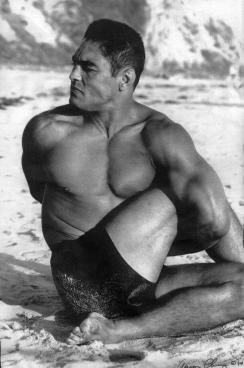 Some of the greatest athletes are doing Yoga these days, yet men are still too manly to do Yoga. But the funny thing is that men seem to be more concerned with their physical appearance these days than women. Women have taken the steps to better balance out their physical and mental nature and men still choose to fight this natural law of balance. So to clarify things I pulled another article of why we as men should not be scared of a couple of incense or the “spacey” guy smiling in your direction. You will never know the true benefits until you give it a “non-judgmental” try. Through Yoga , particularly Meditation, men can look deeper into themselves, listen to their inner voice, and develop a more positive view on life, thus, enhancing their relations with other people. Since men are more into sports and other physical activities, practicing Asanas (postures) will help offset any physical irregularities that they may acquire from such tasks. Like in sports such as golf or tennis, there is a tendency that some muscles are used more than their respective symmetrical counterparts (i.e. right and left arms, legs, etc.) Asanas help by loosening tightness in the muscles, bringing the body back into its natural alignment. < Previous Why laughter could one day save your life.